ePublishing Knowledge BaseePublishing Knowledge BaseePublishing Knowledge Base RSS FeedsHow do I create an RSS feed for a single topic? By default, ePublishing creates an RSS feed for all single-term taxonomies. 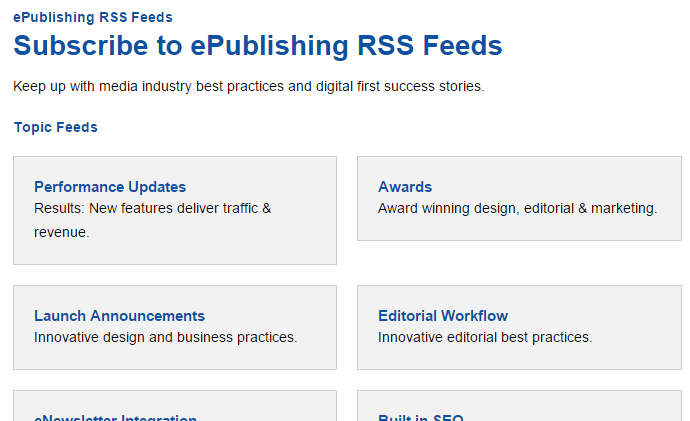 This article shows you how to access those RSS feeds. 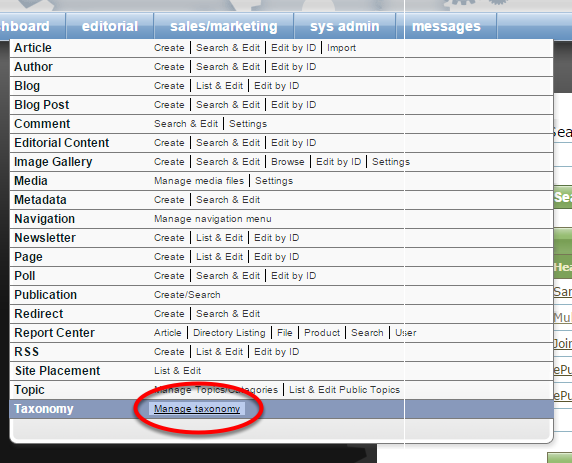 Use the ePublishing RSS Manager to create RSS feeds that may contain articles or blogs posts from multiple taxonomy selections. Learn how to do that here. To view feeds that are automatically generated based on your taxonomy, go to YOURDOMAINNAME.com/rss. The example above is www.epublishing.com/rss. Each website will have a unique design. You may decide some feeds should not be shown on your website. Please discuss any possible RSS needs or questions with your Solutions Manager. If you'd like to add a new single-topic RSS feed, add topics in your Taxonomy Manager and tag articles and blog posts accordingly. Prev: How do I create an RSS feed with multiple topics/taxonomies? Next: How do I create an RSS feed with full bodies for the articles included?